Instant Pot Parsnips. I love cooking parsnips in the Instant Pot Pressure Cooker. So fast to cook, never loses the flavour that boiled parsnips does and perfect for if you are in a hurry for some quick parsnips. Once you have cooked parsnips in the Instant Pot then there is no going back. Today would have been my Grandad George’s 101st birthday. He was the best grandad that any child could possibly wish for. He was kind, he was loving, he was thoughtful, and he was also a fantastic cook. He was part of that older generation when the women did all the cooking and the husband came home to it being cooked for them. A generation where very few men could cook or even wanted to. But my Grandad was different. He cooked the best ever fishcakes (if you have not tried them yet then you must), could cook a delicious hearty soup, made me amazing liver and onions and taught me that the cheap ingredients, when cooked right tasted the best! But one thing I remember the most was his allotment. It was full to bursting with seasonal fruit and vegetables and it was so exciting to go to the allotment with him and pick food ready for cooking. He got me really excited over root vegetables and this is why today feels like the perfect day to share with you Instant Pot Parsnips. In my Grandad’s day there was no Instant Pot and I doubt he even owned a pressure cooker, yet here we are in 2018 with these amazing electrical pressure cookers that make cooking vegetables so much easier. It is also Meatless Monday and the one day of the week when we should all live meat free and there is not a better day for doing that than when you have lots of Instant Pot parsnips to eat. In my mind parsnips remind me of the smell of Christmas. I even think I have a fetish for sniffing parsnips as I just love the smell. It makes me smile and I love them even more to eat. Dominic looks at me all weird as I smell them as he is peeling them! Normally when we have parsnips they will either be roasted or cooked in a veggie bake. They will also lose their flavour because when boiled they can taste rather flavourless. But get out your Instant Pot to make Instant Pot Parsnips and your food is in a totally different league. If you haven’t got an Instant Pot then I really recommend that you get one, they make cooking so much faster and the food just tastes incredible. Also, if you love roasted parsnips and want to make them lower in calories then you can partly cook them in the Instant Pot, then finish them off in the Air Fryer. I have started doing this and find the art of roasted parsnips are better when partly boiled. Also, if you are like me, you will always end up with a few of the leftover ends of a parsnip that is too small for roasting as it will just burn, well stick these in the Instant Pot! Instant Pot Pressure Cooker Parsnips. Easy and simple and a family favourite at recipethis.com. Add a cup of water to the bottom of the inner pot of the Instant Pot. Add the steamer shelf (trivet) and the steamer basket over it. Peel and chop 4 medium sized parsnips. Season the parsnips with salt and pepper. 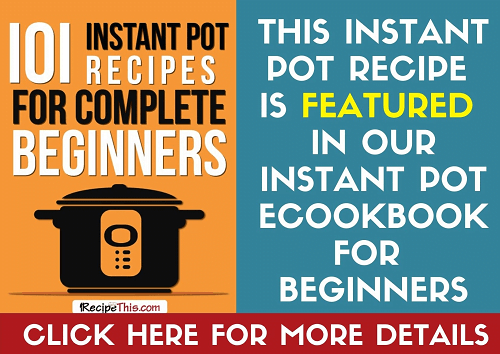 Place the lid on the Instant Pot, set the valve to sealing and cook for 3 minutes on manual. When it beeps manually remove pressure. You can do up to 16 medium parsnips at once on this cooking time. It just depends on how many parsnips that you have. With a lot of Instant Pot vegetables, I cook them for 2 minutes, but parsnips can be hard like potatoes and need a little longer. My Instant Pot parsnips is based on using them as either roasted parsnips, a side vegetable for your dinner or making them for veggie bakes. If you plan to use them for soup or mash, then I would recommend increasing the time to 5 minutes. This will then make your parsnips really soft and easy for cooking with. I love parships! Unfortunately they are hard to find here in Italy but when I do, I fill my shopping basket! Next time I find some will be trying this way of cooking them. Sounds great! We’re in the same boat here in Portugal. We can buy it at an expensive supermarket or the wholesalers but I can buy 30 kilos of potatoes for the same price as 5 single parsnips. If they were easier to get I think we would eat them 2-3 times week if not more.